THE B-MOVIE NEWS VAULT: STOCK YOUR VAULT: New DVDs & Blu-rays for 06/13/2017! STOCK YOUR VAULT: New DVDs & Blu-rays for 06/13/2017! Ack! Sorry for the delay gang! I'm kind of addicted to Friday the 13th: The Game at the moment, so I have been majorly slacking on posting news, reviews, and all that other good stuff you always crave! So getting back on track a tad, let's take a look at all the cool new DVDs and Blu-rays that came out this past week! 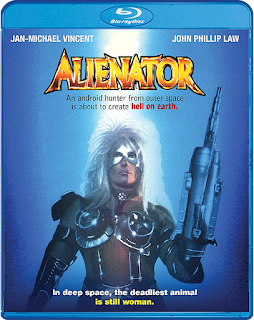 Scream Factory gave ALIENATOR its Blu-ray debut, Mondo Macabro gave INQUISITION a new lease on life, Arrow Video delivered a deluxe 2-disc release for MADHOUSE, and Shout Select gave some TLC to CHEECH & CHONG'S NEXT MOVIE! Other notable releases include: JOHN WICK: CHAPTER 2, LEGO BATMAN, the 4K debuts of RISE and DAWN OF THE PLANET OF THE APES, plus there were numerous bargain-priced DVD and Blu-ray collections that you may want to pick up! To see the full roster of last week's releases, just scroll on down! Contains: Christine, Deliver Us From Evil, Evil Dead (2013), The Exorcism of Emily Rose, and The Last Exorcism Part 2. Contains: Naked Zombie Girl, Mable, and As the Man Drives. Contains: Oblivion, Lucy, R.I.P.D., and The Seventh Son. Contains: The Stand, The Langoliers, and The Golden Years. Contains: John Carpenter's Vampires, 30 Days of Night, Fright Night, Bram Stoker's Dracula, and The Covenant. Contains: Slipstream, Creature, and Incident at Raven's Gate. Contains: Coraline, ParaNorman, The Boxtrolls, and Kubo and the Two Strings.